Thanks to the spread of bonsai around the world many people are familiar with the Japanese art of carefully shaping and pruning trees into living masterpieces. But what about shōhin bonsai? Shōhin bonsai is a category of bonsai that is intentionally kept small, no more than 20 centimeters tall, so that they can be held in the palm of one’s hand. You might think that their small size makes these bonsai easier to raise and care for, but in fact it’s quite the opposite! Sculpting these cute pieces takes a fine touch and daily attention, and artisans gather to show off their hard work at the Gafūten exhibition each year in Kyoto. Held by the All Japan Shōhin Bonsai Association in January, Gafūten has over 40 years of history as a venue for shōhin bonsai artisans, collectors, and admirers to meet and share their work. With an admission cost of 800 yen for adults and free for those under eighteen, Gafūten takes place in the Kyoto International Exhibition Hall Miyakomesse and is divided into two main areas: display and sale. 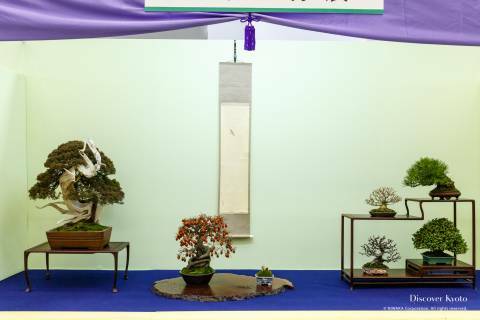 On display at the exhibition you will find a variety of gorgeous pieces submitted to the year’s bonsai contest. 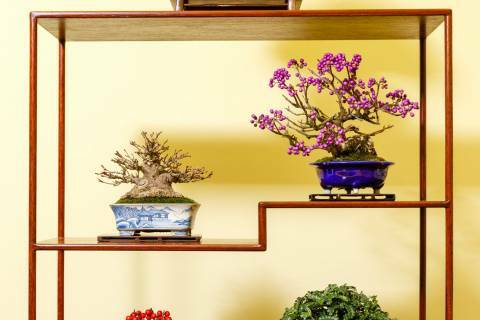 Showcased on charming stands or shelves and sometimes accompanied by painted scrolls, these miniature trees represent some of the best shōhin bonsai from around the country. Students of bonsai from around the globe send in their works via the World Shōhin Bonsai Photo Contest, which results in a wall of photographs representing bonsai from countries such as Italy, Spain, Singapore, the United States, Germany, Malaysia, and more. Also, don’t forget that half of a bonsai work is its pot, so ceramic artists get their own moment to shine in the Modern Miniature Flowerpot Artisan Exhibition. 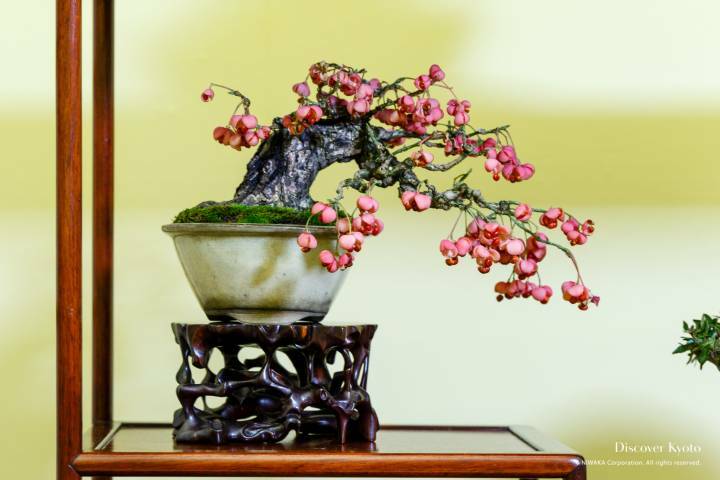 In the sales area, gardening companies from across the country offer up their carefully cultivated shōhin bonsai, and the variety of plants available is absolutely stunning. In addition to bonsai staples such as pine, maple, and juniper, you will find seasonal plants like camellia, plum, and flowering quince, as well as some extra colorful notes from beauty berry, Japanese spindle tree, and cotoneaster. For shoppers, there are shōhin bonsai suited to any wallet, with prices ranging from a mere 300 yen for young plants ready to be shaped to over 1,250,000 yen for works of art that have years of effort put into them. 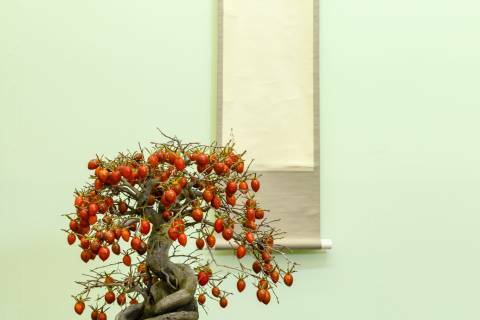 For those who speak Japanese, the Gafūten exhibition is also a chance to participate in a variety of events including free bonsai seminars, live flowerpot making demonstration, a guided tour of the displays, pair workshops, and bonsai consultations. 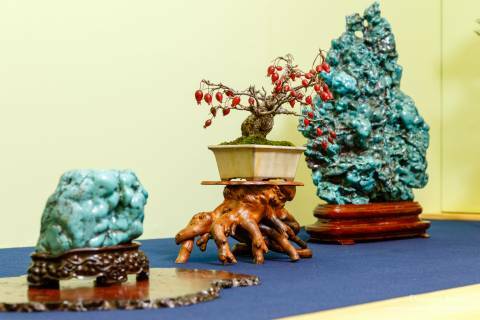 Even if you can’t speak the language, the Gafūten shōhin bonsai exhibition is a chance to see a shocking number of bonsai under one roof, making it a great choice for those interested in gardening, nature, or bonsai specifically. January 11th – 13th, 9:30 – 16:30 (last day 9:30 – 16:00). Check the official blog for future details.